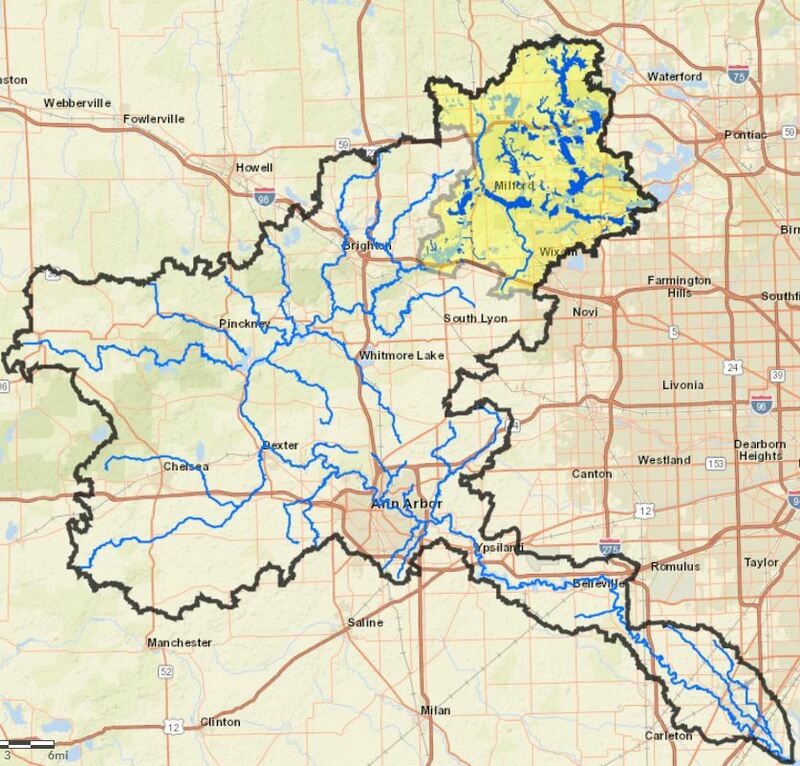 The portion of the Huron River Watershed known as the Upper Huron is a 107 square mile area that extends from the headwaters of the Huron River downstream to the Kent Lake impoundment in Kensington Metropark. The Upper Huron contains nearly 700 individual lakes comprising approximately 9,000 acres, Pettibone and Norton Creeksheds, and innumerable wetlands providing water quality and aesthetic value. The subwatershed lies within Oakland County and comprises all or portions of the Townships of Commerce, Highland, Lyon, Milford, Springfield, Waterford, West Bloomfield and White Lake, the Villages of Milford, Orchard Lake and Wolverine Lake, and the Cities of Novi, Walled Lake and Wixom. The Upper Huron is a mixture of urbanized areas and rural/agricultural lands, many of which are experiencing some of the state’s most intense development pressures from a growing economy and urban sprawl. The natural ecosystem and the water used for drinking, swimming, fishing, and boating is threatened by the cumulative impacts of urbanization via stormwater runoff, poorly maintained septic systems, increased sewage discharge, alterations in water flow, and development in wetlands and floodplain woodlands. For additional information about the Upper Huron’s geography and water quality, visit HRWC’s Infostream. Along with communities from the area, HRWC established the Upper Huron/Kent Lake Subwatershed Advisory Group (SWAG) in 2000 to develop the initial Kent Lake Subwatershed Management Plan prepared under section 319 of the Clean Water Act to meet the Total Maximum Daily Load (TMDL) for phosphorus. Public participation was a major component for this plan, including the use of a series of press releases, two public meetings and six news articles to help garner participation and input into the development and implementation of the plan. During development of the subsequent Upper Huron/Kent Lake Subwatershed Management Plan finalized in 2006 and required as part of the Phase II Watershed-based Storm Water Permit program, the SWAG held two public forums and received feedback from the general public through the use of surveys. In order to meet these phosphorus TMDLs and improve overall water quality, HRWC and SWAG partners have employed a broad range of tools. Managerial best management practices (BMPs) include institutional, educational, or regulatory measures of pollution prevention. Managerial BMPs focus on modifying behaviors and practices through a wide variety of activities such as adopting new policies and ordinances regarding land use planning, providing watershed public information and education to residents, and conducting monitoring. While the SWAG no longer meets regularly, HRWC continues to work on projects to improve water quality in the Upper Huron. Currently, HRWC is also overseeing the development of stormwater demonstration projects in Wixom to replace conventional and poorly designed stormwater detention basins with innovative designs to reduce loads of phosphorus and other pollutants to the Huron River and Norton Creek. For additional information about HRWC’s work in Upper Huron, contact Ric Lawson.